Springfield, Massachusetts. As four dark, turtle-shaped thugs commit crimes, a shadowy figure in an office declares himself the mastermind behind the city’s recent crime wave. He is: The Decider. On the farm in Northampton, the Turtles watch the news. According to the Mayor and the Police Commissioner, Springfield’s crime wave is the work of four men dressed in turtle costumes, wielding ninja weaponry. They even have security camera footage of the four fiends robbing a convenience store. The Turtles are rightly disturbed by this, as they have no memories of committing any crimes. Splinter and Casey step into the living room and Splinter suggests they go to Springfield and learn who is using them. That night in Springfield, the Turtles stake out the store they supposedly robbed, hoping to find a clue. Suddenly, they go into a trance and begin fighting amongst themselves. Casey and Splinter intervene, hitting the Turtles upside the head and snapping them out of it. The next evening, back on the farm, Casey makes the discovery that the Turtles are once again missing. Casey dons his hockey mask and, alongside Splinter, heads for Springfield. They trail the Turtles to the First Bank of Springfield, where they find them robbing the place. Casey wants to stop them, but Splinter realizes that they’re better off following the Turtles back to the one who is controlling them. The Turtles bring their loot to City Hall and hand it over to the Decider… who is really the Mayor! The Mayor exposits that he discovered some while back that he had latent psychic abilities which permitted him to control those with weak minds. He used that power to sway the city’s populace into voting for him, but he found the role of Mayor not to be financially rewarding enough. That’s when he discovered the Turtles and took control of them to carry out his bidding. Alas, the Police Commissioner’s mind isn’t weak enough for him to control and he fears that he may uncover his scheme. The Decider then delivers his next order: Tomorrow night, the Turtles will kill the Police Commissioner. The next morning, Splinter tells the Turtles everything he and Casey overheard at City Hall. He tells his sons that the only way to beat the Decider is to strengthen their minds. The Turtles spend the day in meditation to fortify their psychic defenses. That night, the Decider takes control of them and they knock Casey aside as they leave the farm. Eventually, they reach the bank they robbed and find the Police Commissioner investigating. They’re about to launch their attack when the Commissioner mentions that the “case” is a tough one to crack. Leo is reminded of Casey and snaps out of it. He knocks some sense into his brothers and they formulate a plan to defeat the Decider once and for all. They report back to the Decider and tell him that the Commissioner is dead. Pleased, the Decider immediately holds a press conference, lamenting the tragedy of the Commissioner’s death. The Commissioner then pulls up in his car and tells the Decider that the jig is up. The Turtles (covertly) telephoned him and told him that the Mayor had lost his mind and was planning a hit on him. Panicking, the Decider runs back inside City Hall. He’s met in his office by the Turtles and orders them to protect him. The Turtles reveal that they’re free of his control. The shock of being undone destroys the Decider’s mind and he collapses into a babbling wreck. Back at the farm, the Turtles watch the news with Casey and Splinter. The Mayor, completely nuts and going on endlessly about giant turtles, has been incarcerated at the Massachusetts Hospital for the Criminally Insane. Splinter compliments his sons on their mental discipline. He explains that by controlling the minds of others, the Decider let his own mind grow weak and so the shock of losing control destroyed his mental faculties. 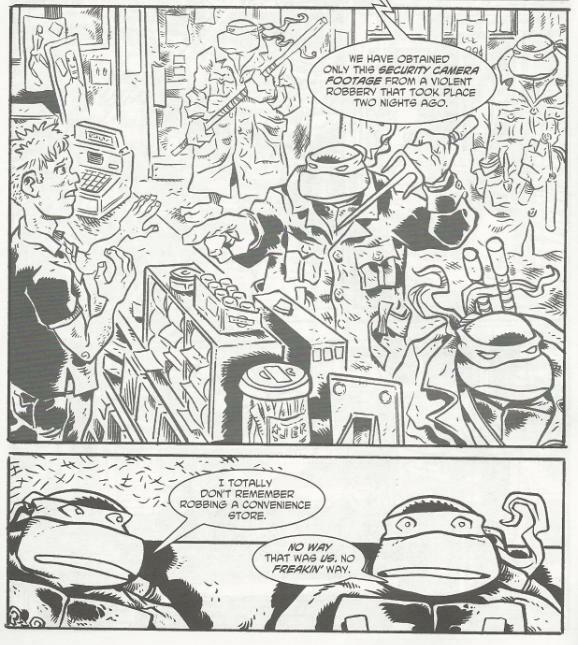 *The editor’s note says that this issue takes place during TMNT Volume 2. 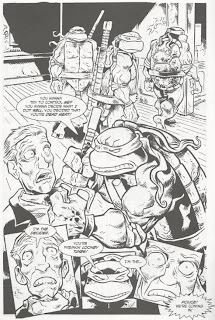 However, the Turtles did not reunite until the very end of TMNT Vol. 2, leaving no room “during” that volume for this story to take place. It works best shortly after the end of Vol. 2 (especially considering Nobody’s absence in Springfield). *CHET ALERT: Page 11, there is a store named “Chet’s”. The name “Chet” was an Easter egg used by the Mirage staff in many of their issues because… they just liked the name! *This issue was originally published with a bonus story, “One’s Shadow!” by Tristan Jones, Kennon James and Eric Talbot, as well as a bonus pin up, “The Klash and the Cure” by Tokka. Jake Black’s “The Decider” would have fit in well as a fill-in issue of TMNT Adventures. 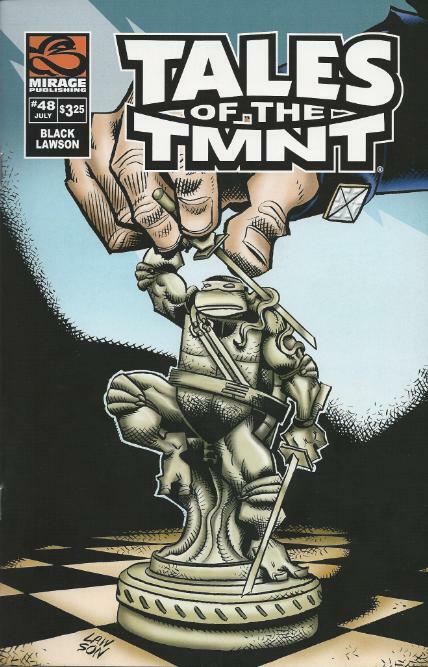 It’s a completely inoffensive, formulaic done-in-one where the Turtles battle a two-dimensional villain with weird powers and triumph by Page 26. It’s not a very deep story, particularly in regards to the bad guy, but I wouldn’t say there’s anything terribly bad about it, either. Critically, I do think “The Decider” could have gone through another round of editorial tightening up. At one point in the story, the Decider orders the Turtles to fight each other to the death. They snap out of it in time and survive. The next night, though, he summons them to his office and goes on in length about what a great asset they are and how glad he is he discovered them. If they’re so vital to his mission, why did he order them to kill each other the previous night? And for that matter, how did he learn about their existence (it’s never explained)? At the start of the book, the Mayor and the Police Commissioner go on television together and warn the people of Springfield about the men in giant turtle costumes committing crimes. At the end of the issue, when the Police Commissioner sees the Mayor babbling about giant turtles, he thinks he’s gone completely bonkers; like “giant turtles” was some non sequitur that only a madman would dream up. But weren’t they just talking about criminals dressed as giant turtles a couple days ago on TV? Things like that chew away at the narrative cohesion of this story and really bring it down. “The Decider” wasn’t that superb of a story to begin with, so these little chinks in the armor don’t do it a whole lot of favors. There’s also the insinuation that the Turtles are “weak minded” and need to undergo special training to defend themselves from psychic attacks. I dunno, I’d kind of like to think that by this point in their lives, after so much training in both physical and mental disciplines at the hands of Splinter, none of the Turtles would be weak minded enough to succumb to the Decider’s control. 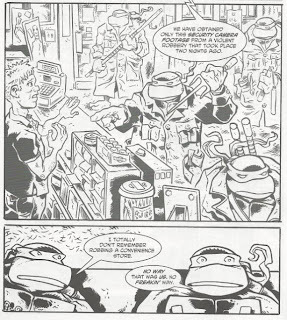 Then again, Braunze mentally manhandled them just recently in TMNT Vol. 2, so perhaps there’s a precedent. And speaking of the Vol. 2 placement, I don’t normally like to contradict editorial notes on chronology, but there just isn’t any place “during” Vol. 2 where this tale can fit. It works fine just immediately after the Volume, however, and the whole bit with the psychic Decider kinda-sorta fits in thematically with Braunze and all his psychic shenanigans from Vol. 2. I suppose if I had any other grievance, it would be Casey donning his hockey mask again. He doesn’t use it for vigilante activities, but to keep his identity safe while he babysits the mind-controlled TMNT, but still. His ditching the mask was a big deal during the end of TMNT Vol. 1 and in TMNT Vol. 2, when he did have to relapse into vigilantism, he wore a bandana over his eyes; consciously refusing to use the hockey mask due to what it symbolized. When he willfully chooses to put the mask back on during TMNT Vol. 4, it’s played as a very big deal (considering certain storylines that he’d been subjected to during that Volume). So seeing him wearing the mask in stories taking place when he’s supposed to be “retired” sort of undercuts his big comeback in Vol. 4. But other tales are guilty of this, so I can’t lay too much blame at Jake Black’s feet. And really, it’s just a mask and Casey never engages in any vigilantism, so I’m making a bigger deal out of this than I ought to. I guess I should also comment on the political subtext. Jake Black didn't like George W. Bush. At all. 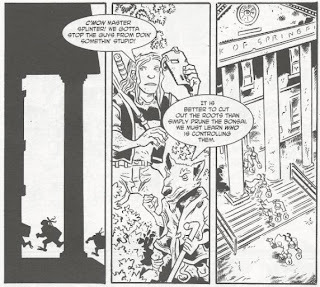 The previous issue, which Black wrote, was an allegory about how he was certain Bush wouldn't relinquish the Oval Office for the next election. The Decider is drawn to look like Bush and is portrayed as a pathetic little man with delusions of grandeur who manipulates others to fight his battles but buckles immediately when faced with direct confrontation. Oh yeah, and Bush once referred to himself as "the decider" during a press conference, so there's that. It's more subtle than Black's commentary from the last issue, but still pretty embedded in the politics of the time period the issue was written. Anyway, “The Decider” isn’t one of my favorites. It’s a rather flimsy story to begin with, brought down further by some narrative hiccups that another pass by the story editor could have solved. On a visual level, though, I think it serves as a great example of how much better Lawson’s pencils look when Talbot’s inks are applied to them. This is one of those issues I passed on back when it came out and passed again a few years ago in the back-issue bin. I was only buying the issues that looked or sounding interesting and this one just didn't pass the eye test for me. Now that I've finally tracked down most every issues of TalesV2 published with a handful of exceptions, I'm disappointed I haven't come across it again. But it's good to know I'm not missing much. Other than maybe the back-up story. What always bothered me about this issue is that it's an obvious, super-heavy handed "Dubya is stupid" comic. I don't care if I agree or disagree with the statement, it's about as in-your-face as Murphy's environmental obsession.